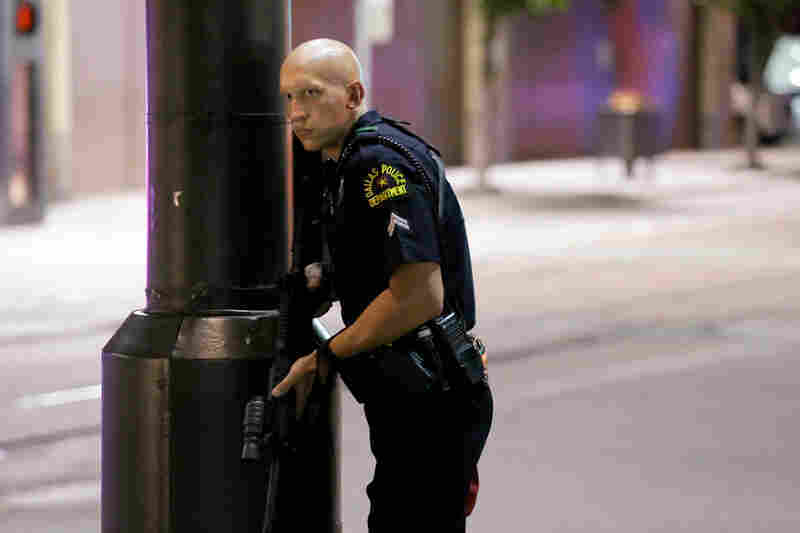 Dallas Shooting: Officials Believe Gunman Acted Alone In Attack That Left 5 Officers Dead : The Two-Way Twelve officers were shot Thursday night, and five died. Officials say the attack was carried out by Micah Xavier Johnson, a military veteran who was killed by a police explosive. 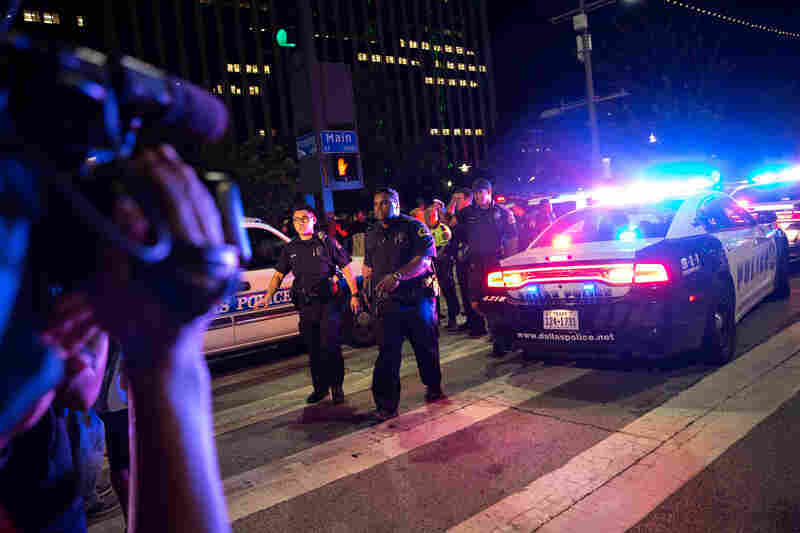 Officials say a gunman shot and killed five police officers Thursday at a Dallas protest against police shootings of black men, in a bout of violence that didn't end until the suspected gunman was killed by police using explosives delivered by a robot. Seven other officers and two civilians were also injured. The suspect, who died in a parking garage, was Micah Xavier Johnson, authorities say. Johnson was a U.S. military veteran who had served in Afghanistan, and told negotiators he was upset about police shootings and wanted to kill white police officers. Law enforcement officers have provided NPR with what they believe is a manifesto from Johnson, which says it should be released after Johnson's death. In the short purported manifesto, the writer points to police shootings of black Americans as his motivation and criticizes the Black Lives Matter movement. Police, who took three suspects into custody, initially said at least four people were involved in the attack. Officials now describe Johnson as the "lone suspect," though they have not ruled out the possibility of co-conspirators. Law enforcement officials with knowledge of the investigation tell NPR's Dina Temple-Raston that evidence suggests Johnson acted alone — and that he had been planning the attack for some time. At a press conference Friday, Dallas Mayor Mike Rawlings said "the city is safe," and healing can begin. Two police shootings of black men prompted the protest in Dallas — and other cities across America — on Thursday night. 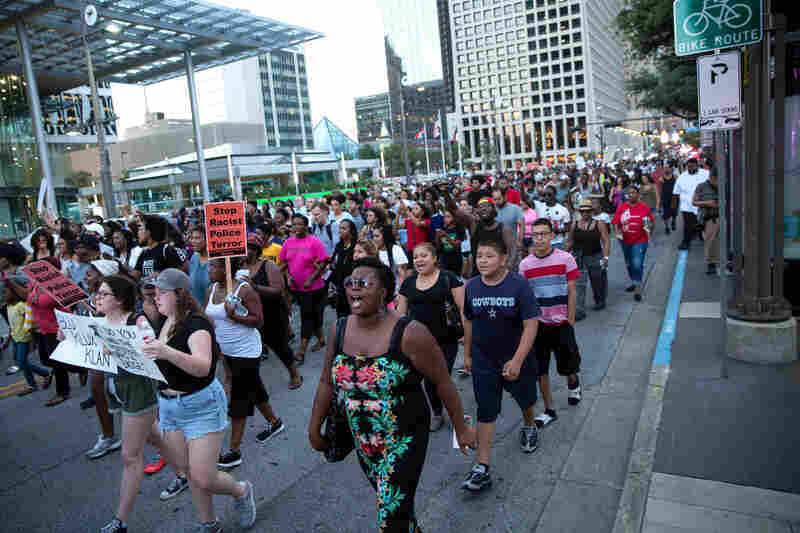 The attack began just before 9 p.m. local time, at the end of a downtown protest march condemning two police killings of black men in other cities earlier this week. Early in the investigation, police said they believed multiple shooters, whom police described as snipers, took elevated positions in a parking garage so they could "triangulate" their attacks and inflict harm on as many officers as they could. Officials now suspect there was only one shooter, targeting what had been a peaceful event. The attack has been condemned by leaders and supporters of the Black Lives Matter movement, who also call for continued peaceful protests over police shootings, The Associated Press reports. Police took three suspects, including one woman, into custody in the aftermath of the attack. 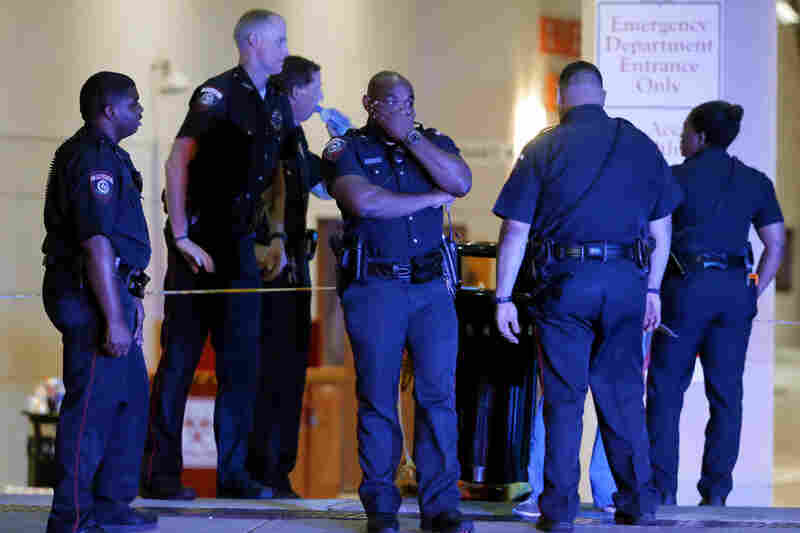 But authorities tell NPR the suspected gunman, who appears to have been working alone, was killed after an hours-long standoff with police at a parking garage at El Centro College in downtown Dallas. The suspect who was killed is Micah Xavier Johnson, two federal law enforcement officials briefed on the investigation tell NPR. The Pentagon confirms that Johnson served in the Army Reserve and was deployed to Afghanistan. He had the rank of Private First Class and was a carpentry and masonry specialist. You can read more at our separate page on what's known about Johnson. Police Chief David Brown said Johnson told negotiators "the end was coming," that he's "going to hurt and kill more" law enforcement, and that there were bombs planted all over the garage and downtown. 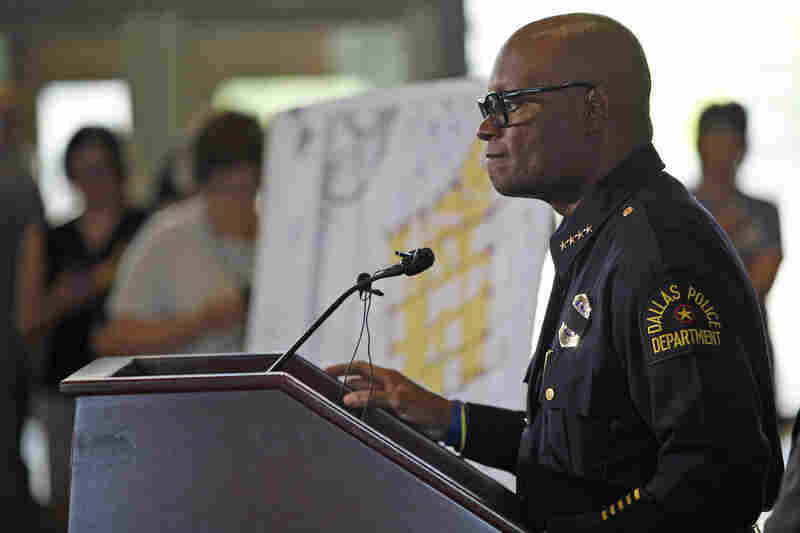 During negotiations with police, the man later identified as Johnson spoke about his motivations, Police Chief David Brown said at a Friday morning news conference. A search of Johnson's home uncovered "bomb-making materials, ballistic vests, rifles, ammunition and a personal journal of combat tactics," police said Friday. Three other suspects were initially taken into custody, three men at a traffic stop and a woman by the parking garage. Hundreds had gathered for the Black Lives Matter rally and march, which was coming to a close just before 9 p.m. CT when gunfire cut through the air. Part of the gun battle that ensued was captured on a Facebook live stream. We'll warn you that it includes images and language some may find disturbing. 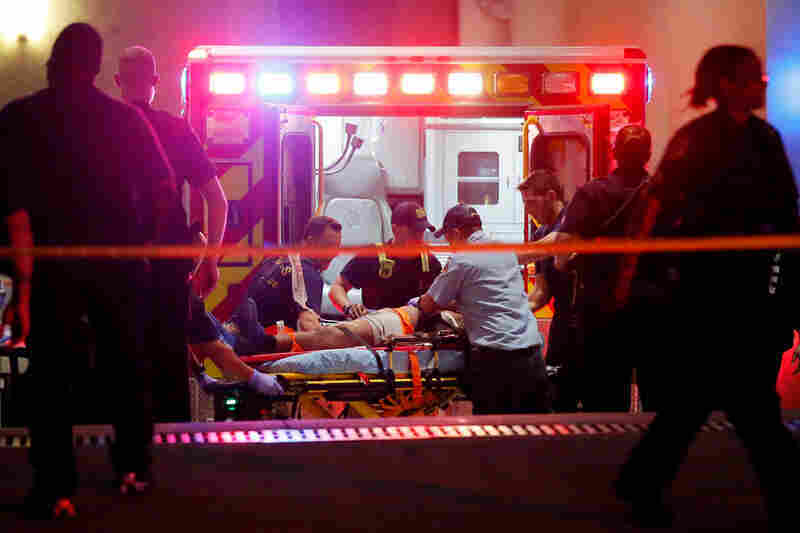 For minutes afterward, gunfire echoed through the city's streets. A gunman in a parking garage exchanged fire with police for 45 minutes, according to the Dallas Morning News. "Robots have been part of police tactical equipment for years, used to surveil crime scenes with cameras, to defuse bombs or to aid in hostage negotiations by delivering phones or food," NPR technology reporter Alina Selyukh says. "But law enforcement and robotics observers say that this may be the first time a police robot has been used to intentionally kill a suspect." 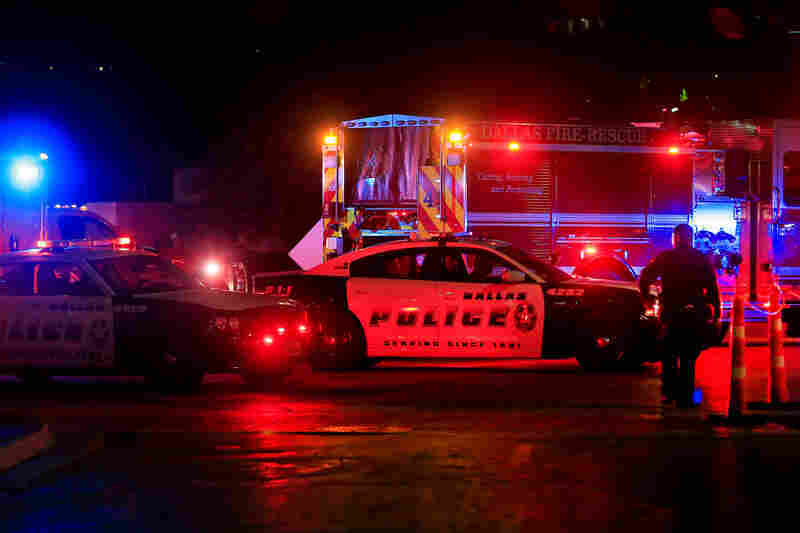 Dallas Area Rapid Transit officer Brent Thompson, 43, was among the slain, according to DART. Thompson had joined the agency in 2009. He is the first officer killed in the line of duty in DART's history. DART Police Chief James Spiller told CNN that Thompson had gotten married in just the last two weeks. Patrick Zamarripa, 32, was one of the four Dallas Police officers who died in the attack. He had served in the U.S. Navy, with deployments to Iraq and Bahrain. The Washington Post reports that Zamarripa had a young daughter. Michael Krol was also killed, NPR's Colin Dwyer reports. Krol, who had worked at a jail system in Michigan, had worked hard to become a police officer, his uncle told Detroit media outlets. He'd moved to Dallas and realized that dream. Officers Lorne Ahrens, 48, and Michael Smith, 55, were also killed in Thursday's attack. "There were really beautiful speakers, a lot of great things were said, and it felt really unifying and we were all standing in solidarity, and that happened, and everyone just scattered and we broke apart. That was probably the most intense and disheartening thing for me, how symbolic it was being linked in arms, feeling this really strong moment and then hearing gunshots, and then everything just fell apart." Rev. Jeff Hood, one of the organizers of the march, said it was always intended to be nonviolent, and that the attack was "not the work of peaceful protesters. This was the work of people who had planned this out very much in advance." "We marched and certainly everything was peaceful. 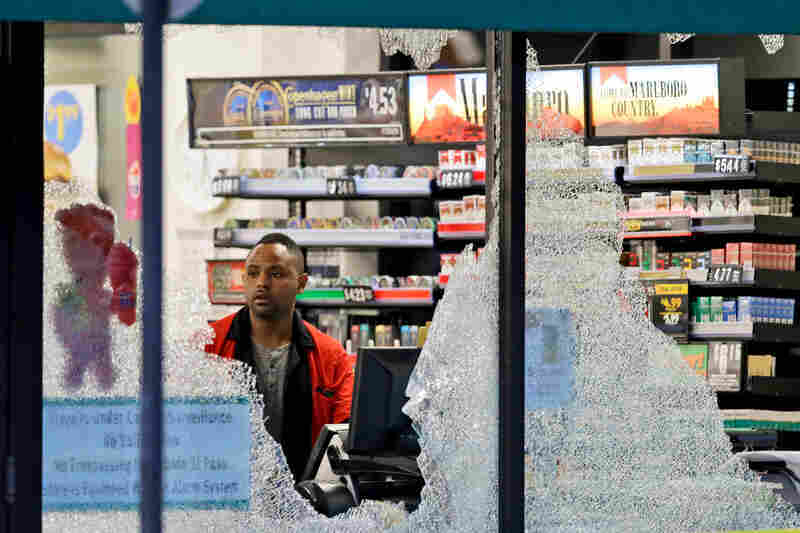 The police were commenting on how peaceful and nonviolent it was," he says. Then, close to the end of the march, Hood was talking to a police sergeant when he heard gunshots. "It's just devastating that these five officers have lost their lives, that they won't be going home to their families this morning. I am devastated, I am angry, I am frustrated," he said. Rev. Michael Waters was also at the march, and he, too, emphasized the positive relationship between the crowds and the police before the shooting began. "The police have been a very active and supportive part in supporting activism here in Dallas," he said. "Any time that I personally have been a part of a rally or march or protest, the Dallas Police Department has been there to protect, to ensure that the march or the rally was orderly and to ensure that everyone made it home safely. On Thursday night, those gathered at the rally had observed a moment of silence and were beginning to return to their cars, Waters says. "People were on their way home," he told NPR. "And it's as we were dispersing that gunshots began to ring out." Waters says his heart goes out to the families of the officers who were killed. When he preaches on Sunday, he says, he will tell his congregation that "we need each other. "I'll preach love, I'll preach unity and I'll preach togetherness in our community," he said. In addition to the local and FBI investigation efforts, the Bureau of Alcohol, Tobacco, Firearms and Explosives says it has some 30 personnel on the scene. 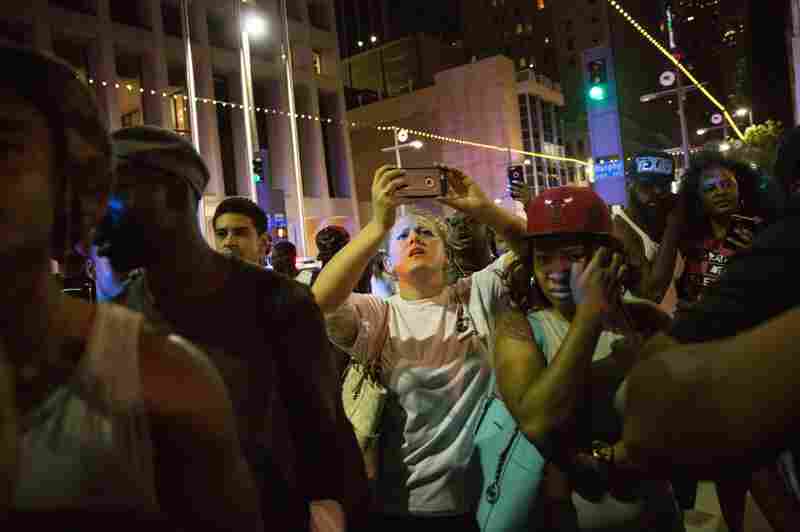 "Everyone is just stunned, beyond belief," reports NPR's John Burnett, who was born in Dallas. 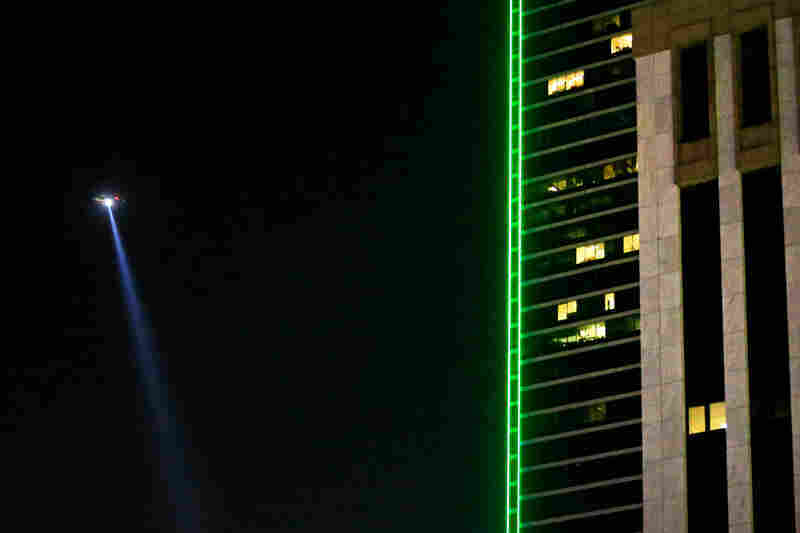 "Last night was just devastating for the city of Dallas. You know, it's taken us 50 years to get over the charge that we are the city of hate, after the [President John] Kennedy assassination. And there were some strange similarities. This shooting happened about two blocks away from where the president was killed. Lee Harvey Oswald knew the parade route, and picked an elevated position from which to attack." Police say that the gunman Thursday night, too, knew the protest route and took an elevated position. Hundreds of people attended an interfaith vigil in Dallas on Friday, mourning the attack. 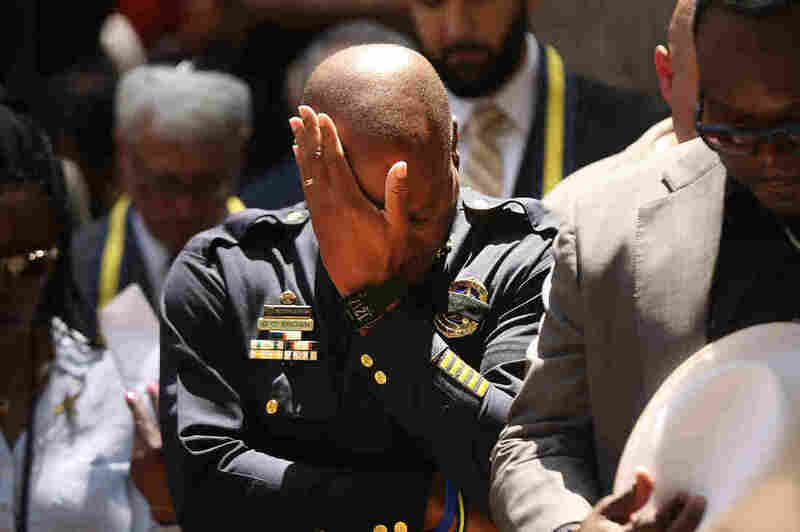 Dallas Police Chief David Brown pauses at a prayer vigil following the deaths of five police officers last night during a Black Lives Matter march. The president added that the FBI is in contact with Dallas police about the case. Obama will be cutting his trip to Europe short to return to the U.S. a day early, and will be visiting Dallas early next week, the White House announced late Friday. In a separate news conference, U.S. Attorney General Loretta Lynch said, "Those we have lost this week have come from different neighborhoods and backgrounds – but today, they are mourned by officers and residents, by family and friends – by men and women and children who loved them, who needed them and who will miss them always." "And to all Americans: I ask you not to allow the events of this week to precipitate a 'new normal' in our country. I ask you to turn to each other, not against each other as we move forward. And I urge you to remember, today and every day, that we are one nation. We are one people." At a press conference Friday afternoon, Texas Gov. Greg Abbott said this challenging time calls for unity and resilience from the people of Dallas and the state as a whole. "We must summon the ability to respond to this challenge in a way that will make Dallas and Texas even stronger," he said.